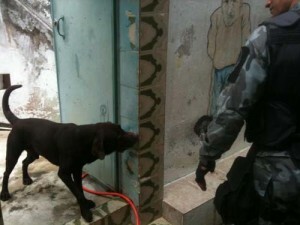 Boss, a labrador dog who works with the Police of Rio de Janeiro,(Cães da PM) is in the blacklist of drug trafficking and has received many threats after finding drugs in a brazilian favela (slum) during a recent police riot . While monitoring the criminals’ radios, the police heard some of them give the order to “shoot the brown” (in reference to the color of Boss’ coat). The K-9 became their target due to his outstanding detection efficiency shown during the past year as well as the findings he made during this police riot on Sunday 28th. According to the brazilian police officer Major Victor Valle, this kind of situation is not strange to any policeman, but it is the first time the battalion registers threats against a dog. After being asked if the routine animal could be changed because of threats, the Major said that “nothing will change”. For him, the role is not taken by Boss as a “job, but as fun.” “He’ll continue having fun,” he added. We hope this hero can continue to have fun and teach the villains who’s the Boss!